Think about that. This was the little girl’s inaugural experience with the joy of splashing in the rain, and it literally stopped her in her tracks. She didn’t care about the water soaking her hair and clothes. She didn’t care about the chill in the air or the dark clouds in the sky. She was simply caught up in the joy of splashing in her puddle. 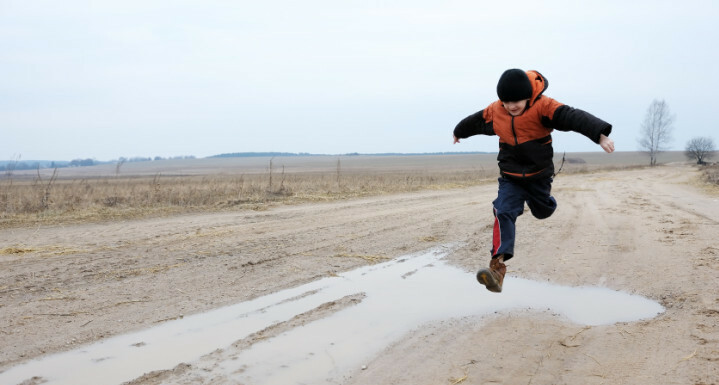 When did I first discover the joy of splashing in puddles? When did I lose that ability to experience wonder in simple things? Here I was rushing through the rain, and totally missing an opportunity for joy. How often do I only see the dark and dreary day, and overlook the beauty sitting right in front of me? When things become common and familiar to us, we often lose the ability to see how extraordinary they really are. I hope I can be more like a little child and find joy in the simple things in life. And I hope the next time a storm comes along, I will be able to find happiness in the puddles.